Do you want to research your family history? Do you want to be able to do some of your research at home? Discover Tacoma Public Library’s genealogy database Heritage Quest. 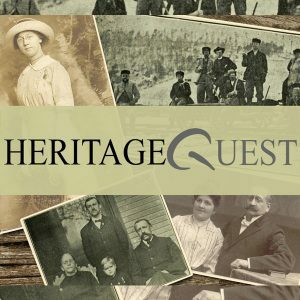 Heritage Quest offers a variety of areas to search. At your fingertips, you can search U.S. Federal Censuses, Revolutionary War records, Freedman’s Bank records, and a variety of other personal and local histories. Once you find the information you are looking for, you can print or email the record to yourself. Begin discovering your family history. If you want to learn more about using our Resource of the Month, stop by any of our eight locations and speak to our great staff.